Today’s blog post isn’t about press coverage, it’s about a press outlet, one sparkling beacon in our fragmented mediaverse worth taking a moment to contemplate. Old media. New media. Social media. It’s a dust storm of content out there and to make sense of it all sometimes seems senseless. Makes you want to run and hide even. So lets tumble into The Rabbit Hole, a diamond in the rough which is swinging the content pendulum back to the happy place where it should be. 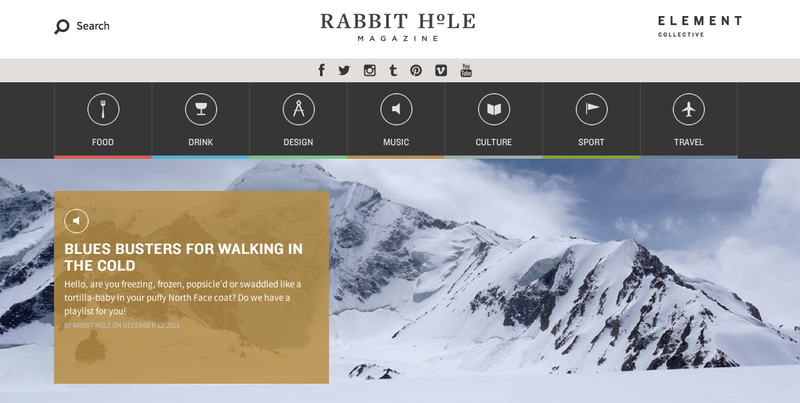 Rabbit Hole Magazine just has that effect, to slip into its looking glass is to enter an amplified world. It is a rare vision of reality where it is not the gossip or the news that matters, but the passion and the personalities that drive the evolution and innovation of culture. Earlier this fall, thanks to creative entrepreneur Anne Owen, The Rabbit Hole producer Kelsey Kreiling and her team flew down from Chicago to spend some time with the genuine team, filming Ryan Goodspeed doing what he does best at The Cypress Room (Clover Club) and the chefs at Harry’s Pizzeria doing its Monday Daily Dinner Special (Roasted Chicken with Salsa Verde and Fennel.) The recipes come to life like no other demo segments we’ve ever seen or could have imagined. Take a ride, below. After all, it’s the journey, not the destination, that truly matters. It’s back to school for the youngsters, and with it a rush of new beginnings and inspiration. In Copenhagen this weekend, the third annual MAD Symposium engaged chefs, cooks and farmers in a platform for idea-sharing, collaboration and learning. A catalyst resulting in grassroots change with global purpose. 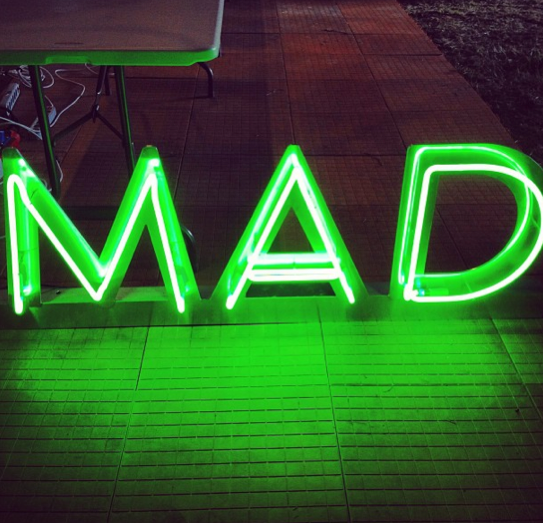 You can follow along and view past videos on the MAD website and blog. Today, California chef David Kinch presented on how restaurants can set up their own farms. Bravo to the organizers for bringing important conversations to the table, stimulating our own creativity and challenging us to think differently. Here at home, South Florida farmers are readying for the upcoming winter/spring 2014 season, and for the first time The Genuine Hospitality Group chefs are working with forager Chris Padin to identify new heirloom ingredients to grow with them. Do you know your wine’s better half? When our intrepid Brand Director Jackie Sayet finds herself off-site and stumpified and flummoxed by either too many incredible wines or stymied by a dearth she will reach out to me via Instagram, Twitter or old-fashioned text message for assistance. This number will remain private, however, as the can of social worms I have opened will inevitably squirm, to Jackie’s delight! Recently while digging through a cooler at a South Miami retail shop she sent a picture of a fairly random selection of labels I didn’t know. My reply was simply for her to rotate all the bottles around and shoot the backs. After receiving the auxiliary information I picked her a bottle to suit her taste and the evening’s motivation. I’m a bit hazy on the exact details of Jackie’s line of questioning in regard to my request for the back labels but I wanted to know who imported each wine. In classic Jackie vinoenthusiasm she loved the revelation that knowing or trusting an importer could make a wine buying decision easier. In classic Sommelier think it struck me as odd that this was not a common sense thought but I quickly checked myself and thought back to when and where I learned this technique. I was a server/bartender at Savoy in Manhattan’s SoHo about a decade ago and was starting to find wine more interesting. I asked our GM and wine buyer, Gil Avital, how I should go about learning more. His advice was essentially, “Drink more, but drink with focus.” We were able to purchase wine directly from the restaurant, and I had been making a solid habit of this. 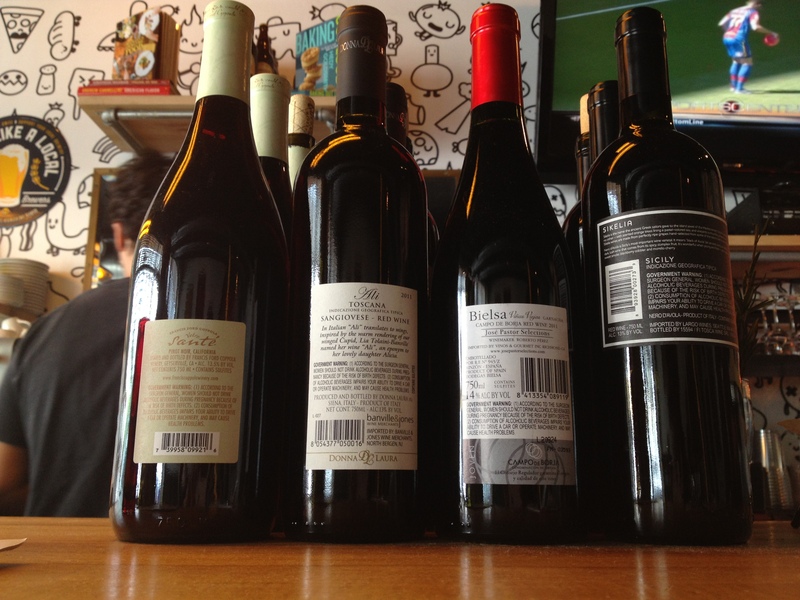 He told me to go look at the backs of the bottles I had liked and to buy more wine from those importers. The first bottle of wine I grabbed had the name Neal Rosenthal on the back. The second also was Neal Rosenthal. The third, well, you get the picture. I drank a lot of Rosenthal wines before moving on to Louis/Dressner, Skurnik and Theise. These importers have long influenced by taste in wine and have strong representation on our wine lists. The style of these importers (traditional production, food-friendly, normal alcohol levels, and an absence of heavy new wood usage) isn’t the top choice for everyone, that’s cool; there is an importer for you. I highly encourage anyone who is looking to explore a wine region to do it though the palates of a few importers. Want to explore Italy? Like to drink Sangiovese? Go buy five different Rosso di Montalcino from different importers (you might have to go to more than one wine shop! ), get a sense of whose you like, at a price point you like and buy more wines from other regions the importer represents. As an added immersion buy an importer’s book if they’ve written one, Rosenthal has and another favorite Kermit Lynch penned a wine-geek must read. In a counter to my own point, I don’t want you to fall into a false negative fallacy. Just because a wine isn’t with an importer you know you like doesn’t mean that the wine isn’t any good. The original argument is about risk aversion and/or knowledge acquisition. I guess as a recommending point I knew that I wasn’t going to give Jackie the green light if I knew I didn’t like the importers style or rather if I knew that the importer had such a range of style that I knew that I couldn’t trust what there would be in the bottle. With importers that have a focused raison d’être such a view point, I can buy with a much better expectation of bottle representation without further consultation. I actually took this advice of my own the other night. As I scanned the small list at a restaurant my wife said, “You don’t like the list, your face hasn’t lit up.” It wasn’t so much that I didn’t like the list but rather that there was only one wine I wanted to drink with the food we chose and while good, I knew it well and wanted to have a new experience. Well, the wine was 86’d but we were offered another selection, I asked to see the bottle and promptly spun the bottle around and saw a familiar name, Banville & Jones. In my experience their style has a large range but the wines are solid. The wine was delicious and will be appearing on a wine list somewhere soon. 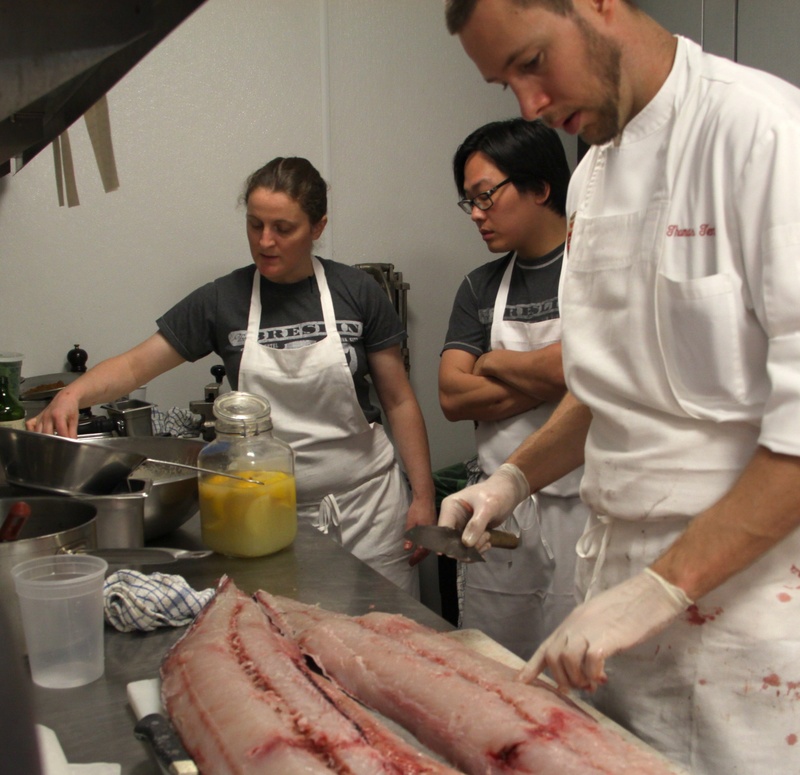 Grand Cayman chef de cuisine Thomas Tennant cutting fish while chefs April Bloomfield and Peter Cho tend to matters of preserved lemons.